Last night we had a lovely dinner at Ted's Montana Grill. And I'm not being sarcastic. The boys were really well behaved. It was like being in a Twilight Zone Episode starring our family. Towards the end of our meal, Big E crawled under the booth to sit next to Mr. Yoy. While it seemed sweet at the time, his true motive was to posture himself next to all the table goodies. Like a Jimmy Buffett song (Mr. Yoy do I need you to approve this part? ), Big E was just looking for a shaker of salt. I watched in horror as Big E put his mouth over the top of the shaker. I never extra salt my food but at this moment in time, I had visions of all the nasty things that could be on the salt shaker. Including now, my kid's mouth. I suppressed the urge to vomit. Mr. Yoy quickly took the shaker away from Big E. But he repeatedly reached for it. So finally, in a fine parenting moment, Mr. Yoy (JOKINGLY, OF COURSE) informed Big E he was going to saw off his hand with the bison knife if he didn't stop reaching for the salt. That ended Big E's salt obsession. Big E climbed out of the booth and made his way over to our neighbor's table while Mr. Yoy paid the bill. Because Big E has zero stranger danger, he chatted up some people he had never met. I had no idea what he was telling them. My guess would be some deep family secrets. I rushed over, grabbed him by the shoulder, made some comment about my over friendly kid, and herded him towards the front door. Mr. Yoy followed behind me by about a minute. He walked out of the restaurant with the patented Yoy smirk. OUR DINNER NEIGHBORS FELT COMPELLED TO TELL ME THAT BIG E SAID HIS DAD WAS GOING TO CHOP OFF HIS HAND WITH A KNIFE. Sweet. I was mortified. Even worse was Mr. Yoy's stone cold response. 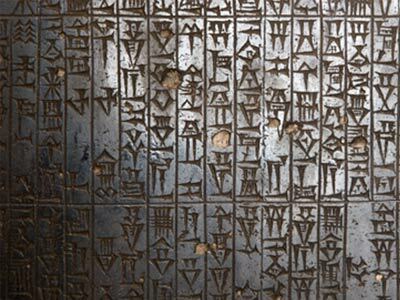 HAMMURABI'S CODE! WE HAVE A VERY STRICT HOUSEHOLD. The car ride home consisted of Mr. Yoy explaining to Big E the art of joking and sarcasm. That went over well (at least I learned something). I'm expecting the Georgia Division of Family and Children services to pay us a visit at any minute. New house rules. The Yoys better study up. And find a translator.